LANCASTER, Penn. 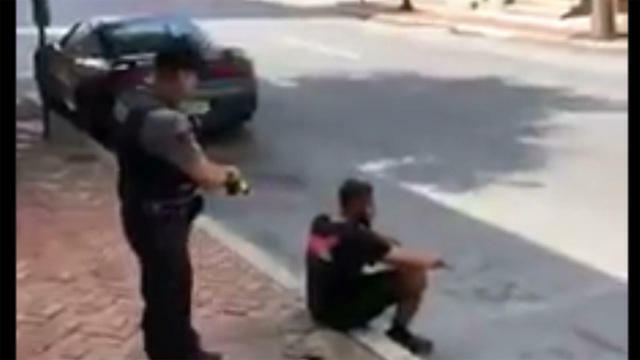 -- A Pennsylvania man who seen on video sitting on a curb when an officer fired a stun gun at his back last week filed a federal lawsuit Monday claiming his constitutional rights were violated. Sean Williams, who is black, filed the suit in U.S. District Court against the officer and the City of Lancaster, claiming police used excessive force, denied him medical care and racially profiled him. Officer Philip Bernot is seen in a video of the June 28 incident in Lancaster telling the 27-year-old Williams to straighten his legs out before deploying the stun gun as Williams is sitting and facing away from him. Police have said that Williams didn't follow their instructions, but his lawyer tells Crimesider that Williams was compliant and was receiving different instructions from two different officers on scene. The lawsuit calls Bernot's actions "shockingly violent." "I think the video constitutes a very obvious example of the unreasonable use of force by a police officer in a situation where the victim was being completely compliant and no Taser was called for," the lawyer, Brian Mildenberg, told Crimesider. The lawsuit says Williams continues to suffer pain and "crippling anxiety." Mildenberg called for Bernot, who is white, to be deactivated as a police officer. In a statement, Lancaster police say that another officer responded to a 911 call reporting a man with a bat who "went after" a group of three people. The officer saw three people telling a man later identified as Williams to get away from them. Williams was repeatedly asking a woman in the group for his Social Security card. The officer said she told Williams several times to sit down, but he refused to comply, police say. About two minutes later, Bernot arrived to assist the first officer and instructed Williams to sit on the curb, telling him he would use his stun gun if he didn't comply. Police say Williams sat and was then "instructed to stick his legs straight out in front of him and to cross his ankles." "This is done as a measure of control to insure that is someone is going to flee or offer physical resistance, they will have to move their legs under them to do so," the statement said. "Non-compliance is often a pre-cursor to someone that is preparing to flee or fight with officers." Police say Williams failed to follow instructions and Bernot deployed the stun gun, the probes striking Williams on his back. Williams can be seen writhing in pain before he is arrested. In the video, Williams can be seen before the stun gun is deployed moving his legs closer to his body. Mildenberg said the first officer to arrive on scene told him to bend his legs and that the instructions from the two officers were confusing. He also said that the officers refused to provide WIlliams with medical attention, though police say he was later checked out by EMS per their protocol. Police said the group that was telling Williams to get away from them never saw him with a bat, and no bat was found at the scene. The group said Williams had been acting increasingly erratically and wanted to fight them, according to police. Williams was found to have an active warrant for possession of a controlled substance and public drunkenness, and was taken into custody on the outstanding charges. He was arraigned and released on unsecured $5,000 bail. Speaking in an interview with Good Morning America, Williams said he didn't believe the officer used the stun gun because of his race, but rather said he believed "police weren't doing their job right." Mildenberg told Crimesider that Williams believes the incident involved racial profiling as laid out in the lawsuit because minorities in Lancaster are disproportionately affected by arrests and use-of-force incidents, but he doesn't believe he was Tased because he is black. "Nobody should be Tased in the back in a situation where they're not doing nothing wrong," Williams told Good Morning America. "If they're following every directive that's being given to them, there's no reason that somebody should get stunned in the back to the point where they could be traumatized for the rest of their life." A Lancaster police spokesman didn't return a call from CBS News Crimesider requesting a response on the lawsuit's claims. The incident is being reviewed by the department's Use of Force training cadre and command staff, according to the police statement. Mayor Danene Sorace released a statement last week saying she was upset by the video. "Like you, when I saw the video I was upset by it and it is of great concern to me. We take the use of force very seriously," Sorace said in the statement, according to Lancaster Online.